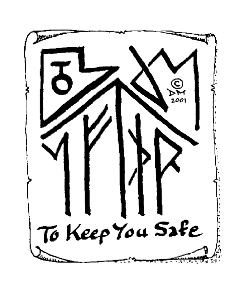 Thank you for requesting a copy of our very special ‘Keep you Safe’ RuneScript. This Wyrd-Rune was designed by my father, Dusty Miller 12th, in 1956, to keep me safe during my military service. It utilises some rather ancient runes that one of my ancestors ‘stole’ from Hengist, some 1550 years ago. Hengist, was the Jutish Warlord, (from Lüneburg in North Germany) who became the first ‘King’ of our part of England, in the ‘Dark Ages’. I wore it on my ‘dog-tag’ and was very pleased with its effects. It kept me alive whilst on active service in Cyprus; it even saved me from the ‘bullet with my name on it’ by making me turn at the critical moment so that the shot went into the muscle of my thigh instead of my stomach, allowing me to escape with just a flesh wound. Since then many other warriors have carried a copy of this RuneScript into battle with them, in Northern Ireland, Israel, the Falklands, the Gulf, and the warring states of the old Yugoslavia; as well as Afganistan and Iraq; with excellent results. It works on the principle of using a very subtle visual message to your brain that will stimulate your sub-conscious mind to wake-up and act like a ‘Guardian Angel’. All you need to do is print out this page, and then cut-out the RuneScript. The RuneScript should then be stuck up somewhere, where it will catch your eye as often as possible, so that you pick up it’s message subconsciously on a regular basis. One very effective way, is to tape, or stick, the RuneScript, by your bed-head, so that you see it last thing at night. This way, your sub-conscious mind gets something to think about whilst you are busy dreaming, and the idea is re-enforced when you see the RuneScript again in the morning. There is no charge for this particular RuneScript; as it is our heartfelt contribution to the War Against Terrorism, that appears to becoming more and more active in modern society. Please use this URL if you want to refer to this page. Thank you very much!